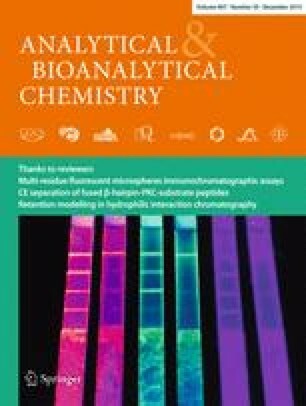 A fluorescent core-shell molecularly imprinted polymer based on the surface of SiO2 beads was synthesized and its application in the fluorescence detection of ultra-trace λ-cyhalothrin (LC) was investigated. The shell was prepared by copolymerization of acrylamide with allyl fluorescein in the presence of LC to form recognition sites. The experimental results showed that the thin fluorescent molecularly imprinted polymer (FMIP) film exhibited better selective recognition ability than fluorescent molecularly non-imprinted polymer (FNIP). A new nonlinear relationship between quenching rate and concentration was found in this work. In addition, the nonlinear relationship allowed a lower concentration range of 0–5.0 nM to be described by the Stern–Volmer equation with a correlation coefficient of 0.9929. The experiment results revealed that the SiO2@FMIP was satisfactory as a recognition element for determination of LC in soda water samples. Therefore this study demonstrated the potential of MIP for the recognition and detection of LC in food. The online version of this article (doi: 10.1007/s00216-015-9083-6) contains supplementary material, which is available to authorized users. This work was financially supported by the National Natural Science Foundation of China (Nos. 21107037, 21407064, 21407057, 21176107, and21277063), Natural Science Foundation of Jiangsu Province (Nos. BK2011461,BK2011514), National Postdoctoral Science Foundation (No. 2013M530240), Postdoctoral Science Foundation funded Project of Jiangsu Province (No. 1202002B) and Programs of Senior Talent Foundation of Jiangsu University (No. 12JDG090), Ph.D. Innovation Programs Foundation of Jiangsu Province (No. CXZZ13_0681).